DALLAS – The last time Jakub Kindl likely scored two goals in a game was back in his junior hockey days. A former 50-plus point player for the Kitchener Rangers of the Ontario Hockey League, Kindl had never recorded more than one goal in any of his 480 combined AHL and NHL games – that is until Saturday. Kindl added to the frenzied up-and-down pace inside the American Airlines Center, scoring twice within 45 seconds to pull the Red Wings even with the Dallas Stars early in the third period. At first, it looked like his offensive contributions might not be enough for the undermanned Red Wings, who finished the game without their captain and leading scorer. Playing in one of the craziest games of the season, the two teams combined to score 13 goals on 70 shots, and the Wings overcame three separate deficits – including a pair of two-goal deficits – to claim two big points in the Eastern Conference standings. Pavel Datsyuk racked up three of his four points in the third period and overtime, and Kronwall scored 36 seconds into the 4-on-4 session to lift the Red Wings to a maddening 7-6 victory over the Stars. 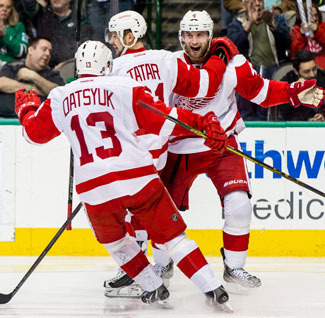 Datsyuk scored twice and Justin Abdelkader and Gustav Nyquist also tallied for the Wings. According to the Elias Sports Bureau, the Red Wings are the first team to trail by two goals or more in the third period, tie the game, and fall behind again by at least two goals before eventually winning the game since Jan. 16, 1934 when Toronto earned a 7-4 win over Ottawa. While Datsyuk was clearly the difference maker again, the Wings comeback doesn’t get going without Kindl’s goal. The 28-year-old defenseman, who was in Grand Rapids on Friday, was brought back early from a conditioning stint with the Griffins, the Wings’ AHL affiliate. His return was necessary as Kyle Quincey is suffering from a reoccurring chronic lower-body injury. Kindl entered Saturday’s game with 11 career goals in 241 games with the Red Wings, but with his team trailing by two goals at the start of the third period, he found himself in ideal situations on back-to-back shifts. Kindl missed exactly eight weeks after he sustained an elbow injury during practice in Boston on Dec. 28. Detroit nearly lost this game in the middle frame, the portion of the game that they have been dominant all season. However, they were uncharacteristically soft late in the period, allowing goals by Trevor Daley, Cody Eakin and Erik Cole in a three-minute span as the Stars took a 4-2 lead into the second intermission. The Stars out-scored Detroit 3-1 in the middle frame. The Red Wings are now 6-10-3 when they’ve been out scored in the second period. Dallas added two more goals to take a 6-4 lead that chased goalie Jimmy Howard for the first time this season as the result of something other than an injury. Howard, who was pulled Dec. 19 against the New York Islanders and Jan. 10 at Washington, gave up six goals on 32 shots Saturday. Detroit had gone 97 regular-season games without allowing six or more goals in a regulation loss. The last time occurred in a 6-4 loss at Nashville on Dec. 30, 2013. Backup Jonas Gustavsson relieved Howard with 9:23 left in regulation. It was Gustavsson’s first appearance since Nov. 5 when he suffered a shoulder injury against the New York Rangers. He stopped both shots that he faced in earning his second win of the season. The Stars managed to dismantle the league’s top power play for much of the night, limiting the Red Wings to two shots during their first two chances. But on their third power play, Abdelkader tipped in a shot that cut Detroit’s deficit to one goal, 6-5, at 12:47 of the third. Datsyuk then scored the tying goal at 18:12 – his second of the night – that eventually forced overtime. Henrik Zetterberg was injured early in the second period by Stars captain Jamie Benn, who received a two-minute roughing penalty for punching the Wings’ captain in the head during as scrum in front of Detroit’s crease. Zetterberg finished the period but did not come out for the third. When asked for a status update on the captain’s condition, whether he had a concussion, or if he was injured by Benn, Babcock was non-committal.